Self-Absorbed Boomer: TBT: Neil Sedaka, "Stairway to Heaven"
Long before there was Led Zeppelin, even before there were Yardbirds, there was Neil Sedaka. Brooklyn born and raised (his father was a cab driver) and trained to play classical piano in Julliard's preparatory school program, Sedaka found his true love in pop music as a teenager. 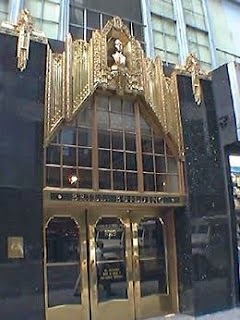 He and lyricist Howard Greenfield, a boyhood friend, became one of the songwriting teams--along with Gerry Goffin and Carole King, Jeff Barry and Ellie Greenwich, Jerry Leiber and Mike Stoller, Barry Mann and Cynthia Weil, and Doc Pomus and Mort Shuman--who had offices in the Brill Building, a 1931 vintage office building at Broadway and 49th Street with an elaborate art deco entrance (photo). 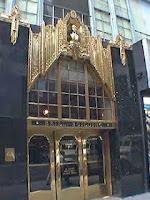 Producers Don Kirshner, George "Shadow" Morton, and Phil Spector also had offices there. Sedaka, like Carole King, was a singer as well as a songwriter. His recording career began in 1957 with "Laura Lee" on the Decca label. His first song to chart was "The Diary," on RCA, for which he continued to record through the remainder of the 1950s and '60s. He cracked the top ten in 1959 with "Oh! Carol," which made it to number nine. In the summer of 1960 "Stairway to Heaven," which apart from its title bears no relationship to the later Led Zeppelin hit, also reached nine on the hit parade. I remember "Stairway" fondly because it was one of the songs that I heard many times on the car radio, along with Roy Orbison's enthralling "Only the Lonely," the Hollywood Argyles' hilarious "Alley Oop," and Ray Peterson's bathetic "Tell Laura I Love Her," when my parents and I went from Tampa to visit my mother's relatives in Pennsylvania and my father's in Indiana during the summer between my eighth and ninth grade years. I always enjoyed these road trips, and music I heard on them got engraved on my memory. An intriguing feature of "Stairway" is the rising "Bwaaaaah!" sound at the end of each chorus. The musicians credited on the song include Irving Faberman on timpani; this sound is likely produced by pedaling the drum. There's also a sax bridge by the then almost ubiquitous King Curtis. Sedaka continued to have hits for RCA through 1961 and '62, when he reached the top of the chart with "Breaking Up Is Hard to Do." His slow ballad version of that song, released on the Rocket label, reached number eight in 1975, but topped the "easy listening" chart, giving Sedaka the distinction of being the only artist to have topped charts twice with different versions of the same song.